Packaged in a black velvet bag with instructions. “After having all of my students practice using the Practice-Right at home and in their lessons, I found that I do not have to spend time during the lessons making corrections to the right hand… it’s staying perfectly in place. The difference in helping to produce a great sound was immediate. I strongly endorse this product for all teachers and players”! “Practice-Right promotes proper alignment of the wrist to the fingers, providing sensory feedback on the amount of wrist flexion and extension one should have when playing guitar. You can use it to stabilize the wrist joint for prevention and treatment of musculoskeletal injuries like tendonitis and carpal tunnel syndrome." See the interview with Artyom. The Practice-Right will aid in achieving proper technique and improve your playing. There are endless reasons why technique is so important and the Practice-Right is an answer for many players. It allows a player to correct bad habits and helps aid beginning players toward a direction that is suitable for proper positioning. Teachers may use it on themselves, then pass along to the student to demonstrate as a "mold" for their own technique. 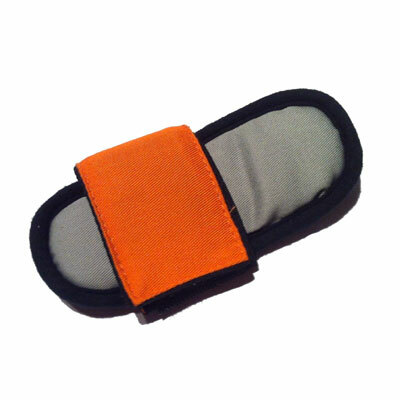 The Practice-Right is comfortable and ergonomic, while allowing full freedom of the fingers. Save time by utilizing this tool to achieve consistency and good tone. Practice-Right is adjustable. The flexible yet supportive core will allow the player to change the angle and make position adjustments. Works well for any player as well as both nylon classical or acoustic steel string guitars. Practice-Right can fit smaller and bigger hands. The adjustable elastic strap fits players with wrist circumferences from 4.5 - 9 inch (11.5 - 23 cm). Bottom line.... Why Practice Wrong when you can Practice-Right! ?